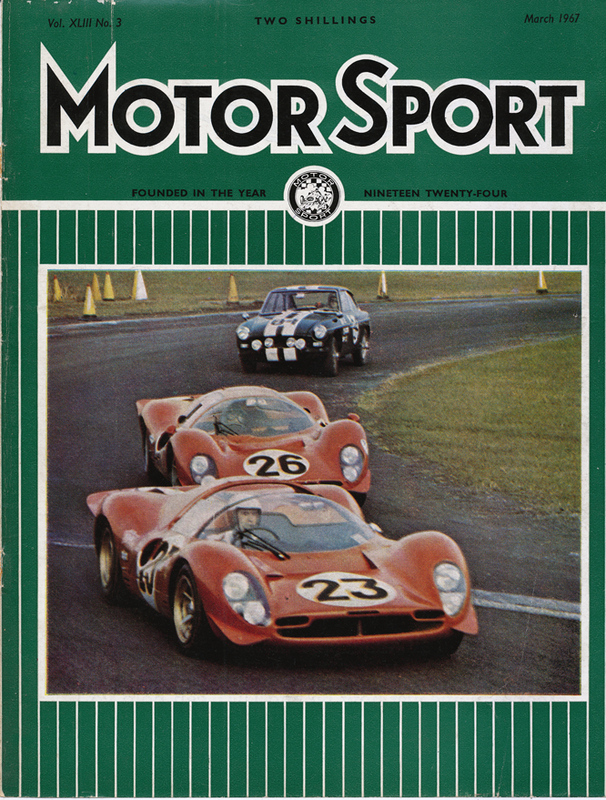 Continuing to clear some of the motor racing stuff I have collected over the years today’s post features a couple of MotorSport covers that are currently on line on my “lightpress” e-bay account. 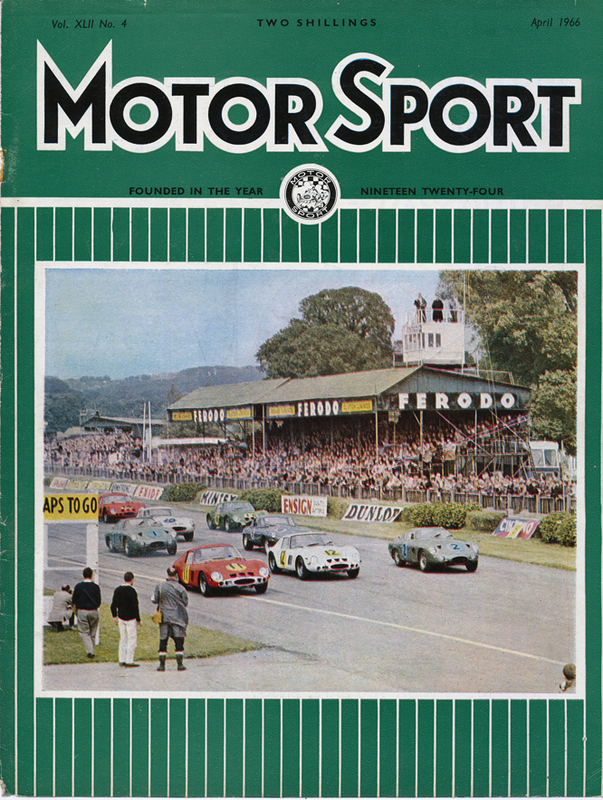 First up from April 1966 the staff at MotorSport believed that the idea of an apparently arbitrary 3 liter / 183 cui limit on the size of forth coming GT regulations was not either in the interest of the sport, or the British motor industry who’s GT cars from Jaguar and Aston Martin with motors over the new limit would be rendered obsolete despite not being particularly quicker than their competition with smaller motors. The photo shows the start of the 1963 Goodwood Tourist Trophy race featuring four Ferrari 250 GTO’s, 2 Aston Martins and 2 E-type Jaguars which was won by Graham Hill in the #11 250 GTO. By June 1966 the Ferrari V12 3 litre 183 cui Formula One car was looking a good bet to win the championship with 1964 champion John Surtees at the wheel. John is seen guiding his Ferrari 312 fitted with a downsized sports car V12 motor through the streets of Siracusa on his way to an easy non championship victory. Note how Sicilian spectators are clearly seen ligning the inside of the crash barriers which were presumably installed to protect them. By the end of June John Surtees quit the Ferrari team after a disagreement with Ferrari management which deprived him and Ferrari of Championships which up until then had been theirs for the taking. Finally after a humiliating defeat to Ford at Le Mans in 1966 in February 1967 Ferrari stole a little Ford thunder by claiming victory in the Daytona 24 hour race. 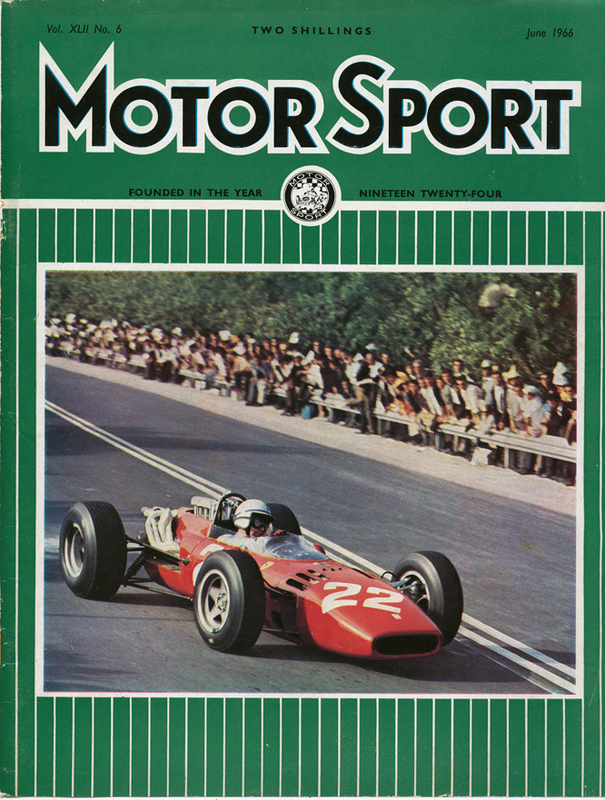 Seen on the cover of the March 1967 edition of MotorSport is Lorenzo Bandini at the wheel of the #23 Ferrari P3/4 he shared on his way to victory with Chris Amon. The #26 North American Racing Team Ferrari P4 driven by Pedro Rodriguez and Jean Guichet finished second. Thanks for joining me on this “Sixties Ferrari Covers” edition of “Gettin’ a li’l psycho on tyres” I hope you will join me again tomorrow. Don’t forget to come back now ! 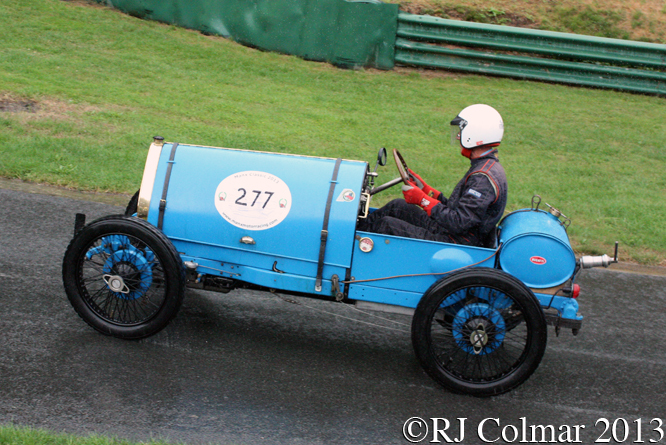 This entry was posted in Uncategorized and tagged 250, 312, Automobilia, Bandini, Colmar, Daytona, Ferrari, GAPOT, Goodwood, Graham, GTO, Hill, Motorsport, P3/4, P4, Ralph, Syracuse, Tourist Trophy on November 8, 2013 by Ralph. In May 1961 a piece of successful Formula One technology percolated into the environs of Indianapolis which started a whole sale revolution in the layout of the cars that would dominate the Indy 500 hence forth in the form of the Kimberly Cooper Special driven by Jack Brabham. 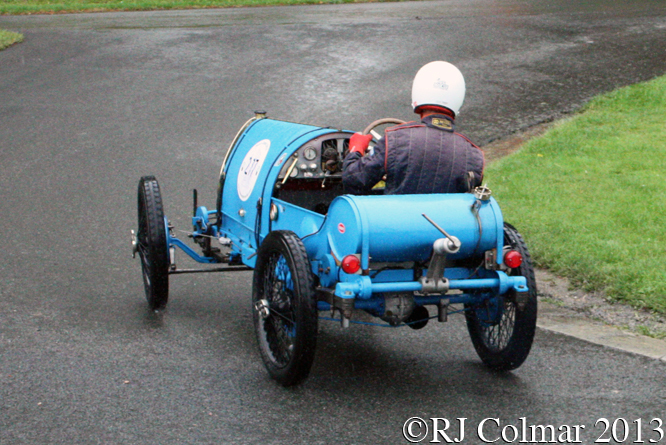 The Kimberly Cooper Special was the smallest car in the field and possibly with the least powerful motor, but what everyone present learned from the car that started 19th and came in 9th was that the li’l funny car with the engine in the back could handle the corners so much better than the hitherto dominant front engine Roadster machines that the lack of 150 hp made little or no difference. 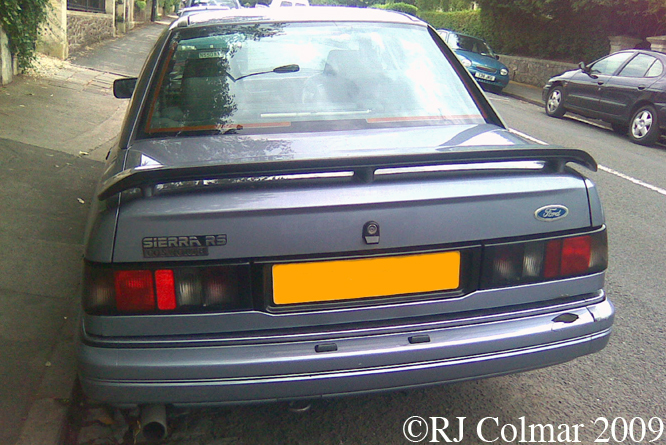 Imagine just putting the engine in the back of your car giving a 150 hp advantage ! It was a no brainer, but in 1962 only the Californian Speed King Micky Thompson and ’55 & ’56 Indy winning owner John Zink had rear engined cars prepared for the Indy 500. Rookie Dan Gurney who passed his Rookie test in a Roadster was keen to drive either of the rear engined cars in the race in an effort to impress Lotus boss Colin Chapman whom he had invited over from Europe at his own expense in an effort to entice Colin into building Lotus indy cars for 1963. Dan gave up on the turbine powered John Zink Track Burner but did manage to qualify 8th in the under powered Thompson Buick and come home in 20th. 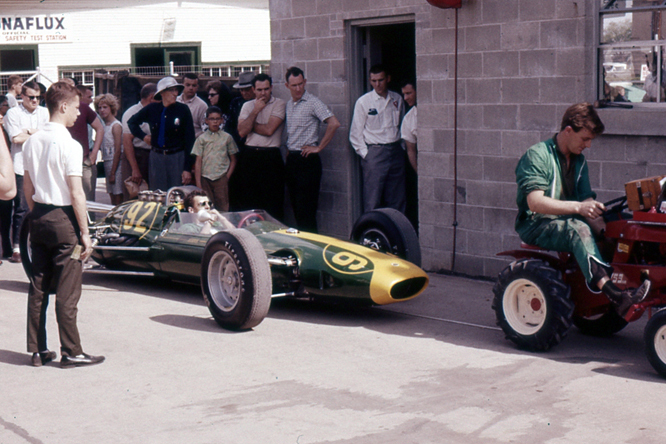 Chapman was sufficiently impressed with the Indy 500 and it’s potential rewards to build the Lotus 29 seen here for the 1963 race. The Lotus 29 featured a monocoque chassis, as campaigned in Chapman’s successful 1962 Lotus 25 Grand Prix car, in place of the usual tube space frame and it had a powerful version of a Ford stock block V8 in place of the almost ubiquitous 4 cylinder Offy that had been winning at Indy since the mid 1930’s and could trace their ancestry back to the Millers of the 1920’s. Jim Clark and Dan Gurney were to race the Lotus challengers Clark qualified chassis 29/3 5th and Gurney chassis 29/1 12th. 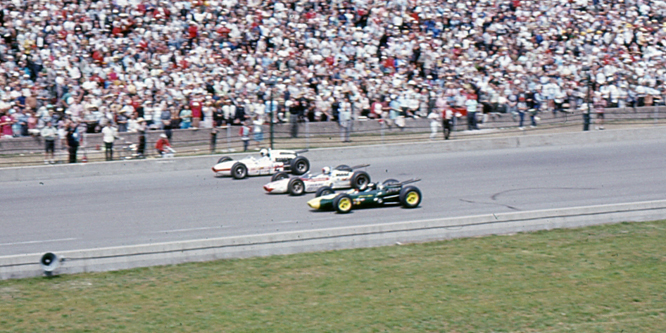 Towards the end of the race Clark was challenging Parnelli Jones for the lead when Jones Watson developed an oil leak, but the USAC officials managed to refrain from black flagging Jones before the oil stopped leaking which allowed Parnelli to take his one and only Indy 500 victory ahead of the Rookie Clark. Dan came in 7th also completing the full 200 laps. 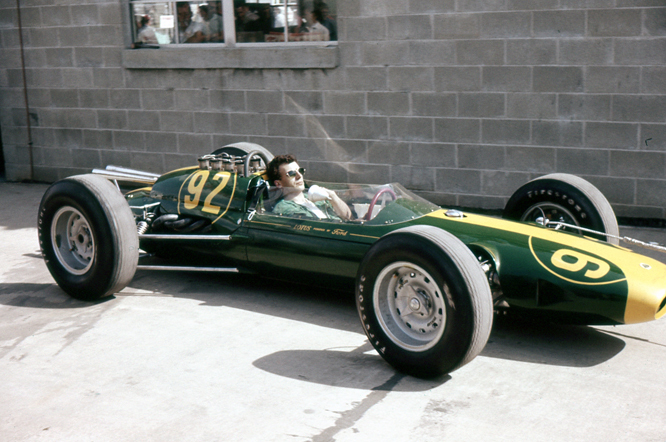 Dan’s chassis #29/1 today sits in the IMS museum painted in the green and yellow colours of Jim Clark’s #92 chassis 29/3. The following year Bob Marshman put #29/2 now known as the Pure Firebird Special on the middle of the front row for 1964 Indy 500 right next to pole sitter Jim Clark in his newer Lotus Ford 34, see above. Bob lost an oil plug going low on the apron while in the lead on lap 37 trying to avoid the slower Johnny White, Bob was eventually classified 25th. Bob crashed #29/2 at Milwaukee and his owner Lindsey Hopkins bought Clark’s #29/3 as a replacement which Bob drove with no more success than he had with #29/2. Despite the fireball at Indy in 1964 Bob tested chassis 29/3 at the seasons end wearing nothing but the usual, for the period, t-shirt and jeans at Phoenix. 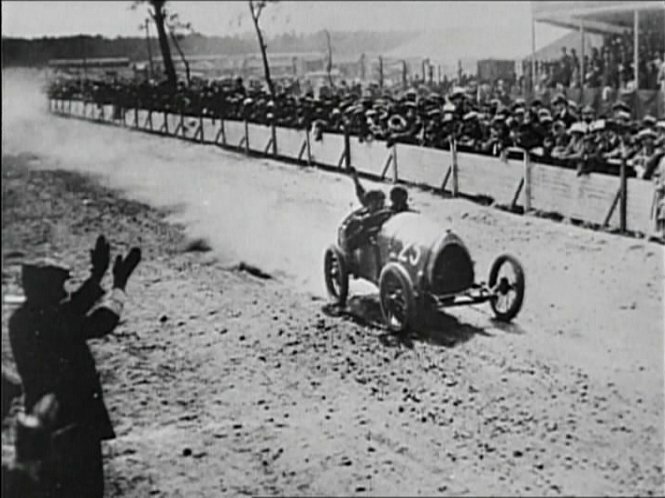 During the session Bob’s car was involved in an accident which ruptured the fuel tank, a week later Bob died of the burns he subsequently sustained. Ed Arnudins photo’s show Lotus Mechanic Colin Riley at the wheel of Jim Clarks of #92 Lotus 29 Ford being towed through the Indianapolis garage area by another Team Lotus mechanic Dave Lazenby who is at the wheel of the dinky li’l towing tractor in the top photograph. 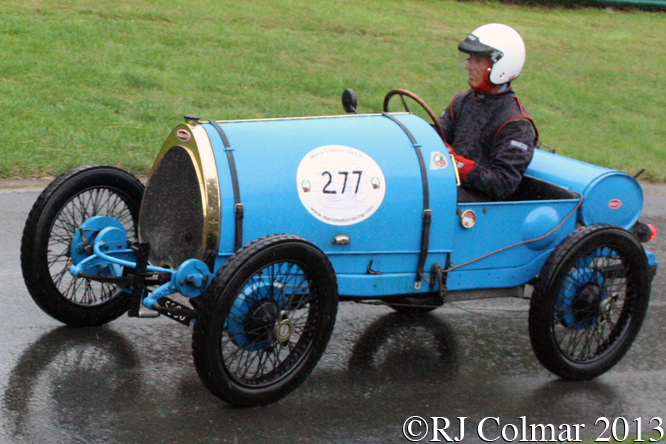 My thanks to Ed and Steve Arnaudin for the photo’s, Tim and B Squared at The Nostalgia Forum informing me of which chassis is featured in today’s post for identifying Colin and Dave in the photo’s. Thanks for joining me on this ‘Oil Leak ? 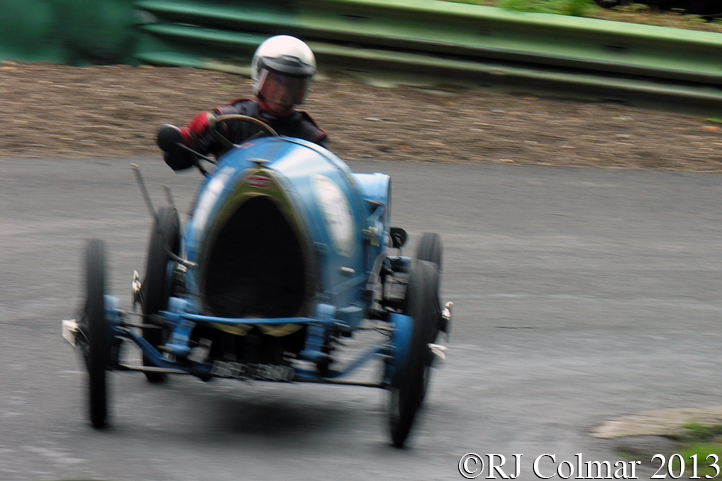 What Oil Leak ?’ edition of ‘Getting’ a li’l psycho on tyres’ I hope you will join me again tomorrow. Don’t forget to come back now ! 05 02 12 ps Thanks to Brian for pointing out the now corrected Bobby Marshman spelling error and pointing out that Bob did not spin out of the 1964 Indy 500. 12 05 14 Since writing this piece it has come to my attention that Bobby Marshman signed his autographs ‘Bob Marshman’ and it seems fitting and respectful to have removed the references to “Bobby”. It has also come to my attention that Bob drove #29/2 on the paved surfaces of USAC’s Champ Car Series up until Milwaukee in ’64 and not #29/3 as originally suggested. He also appears to have lost an oil plug rather than damaged an oil line at Indy as originally suggested. I hope you’ll accept my sincerest apologies for any unintentional confusion caused. 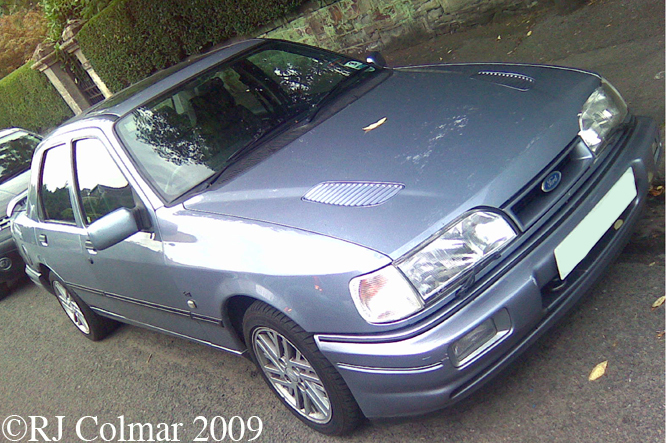 This entry was posted in Uncategorized and tagged #29, Chapman, Clark, Colmar, Ford, GAPOT, Gurney, Indianapolis, Lotus, Marshman, Ralph, Riley on February 4, 2012 by Ralph.